This article is about the genus Helianthus. For the common domesticated sunflower, see Helianthus annuus. For the U.S. Navy patrol boat and U.S. Coast and Geodetic Survey launch, see USS Helianthus (SP-585). "Sunflower" redirects here. For other uses, see Sunflower (disambiguation). "Sunflowers" redirects here. For the former video game publisher, see Sunflowers Interactive. Helianthus or sunflower (/ˌhiːliˈænθəs/) is a genus of plants comprising about 70 species. Except for three species in South America, all Helianthus species are native to North America. The common name, "sunflower", typically refers to the popular annual species Helianthus annuus, or the common sunflower, whose round flower heads in combination with the ligules look like the sun. This and other species, notably Jerusalem artichoke (H. tuberosus), are cultivated in temperate regions and some tropical regions as food crops for humans, cattle, and poultry, and as ornamental plants. The species H. annuus typically grows during the summer and into early fall, with the peak growth season being mid-summer. Perennial sunflower species are not as common in garden use due to their tendency to spread rapidly and become invasive. The whorled sunflower, Helianthus verticillatus, was listed as an endangered species in 2014 when the U.S. Fish and Wildlife Service issued a final rule protecting it under the Endangered Species Act. The primary threats are industrial forestry and pine plantations in Alabama, Georgia, and Tennessee. They grow to 1.8 m (6 ft) and are primarily found in woodlands, adjacent to creeks and moist, prairie-like areas. Sunflowers are usually tall annual or perennial plants that in some species can grow to a height of 300 cm (120 in) or more. They bear one or more wide, terminal capitula (flower heads), with bright yellow ray florets at the outside and yellow or maroon (also known as a brown/red) disc florets inside. Several ornamental cultivars of H. annuus have red-colored ray florets; all of them stem from a single original mutant. 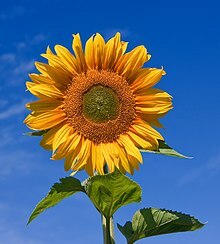 During growth, sunflowers tilt during the day to face the sun but stop once they begin blooming. This tracking of the sun in young sunflower heads is called heliotropism. By the time they are mature, sunflowers generally face east. The rough and hairy stem is branched in the upper part in wild plants but is usually unbranched in domesticated cultivars. The petiolate leaves are dentate and often sticky. The lower leaves are opposite, ovate, or often heart-shaped. They are distinguished technically by the fact that the ray florets (when present) are sterile, and by the presence on the disk flowers of a pappus that is of two awn-like scales that are caducous (that is, easily detached and falling at maturity). Some species also have additional shorter scales in the pappus, and one species lacks a pappus entirely. 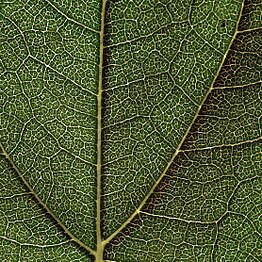 Another technical feature that distinguishes the genus more reliably, but requires a microscope to see, is the presence of a prominent, multicellular appendage at the apex of the style. Quite a bit of variability is seen among the perennial species that make up the bulk of those in the genus. Some have most or all of the large leaves in a rosette at the base of the plant and produce a flowering stem that has leaves that are reduced in size. Most of the perennials have disk flowers that are entirely yellow, but a few have disk flowers with reddish lobes. One species, H. radula, lacks ray flowers altogether. Helianthus species are used as food plants by the larvae of many lepidopterans. The seeds of H. annuus are used as human food. The Journal of Environmental Management has analyzed the impact of various nitrogen-based fertilizers on the growth of sunflowers. In the Province of Siena (Italy), farmers attempted to reduce dependence on petroleum by using different forms of nitrogen fertilizer to better manage the fertilizers’ influence on sunflower growth. Ammonium nitrate was found to produce better nitrogen absorption than urea, which performed better in low-temperature areas. In Brazil, a unique system of production called the soybean-sunflower system is used: sunflowers are planted first, and then soybean crops follow, reducing idle periods and increasing total sunflower production and profitability. Sunflowers are usually planted in the extreme southern or northern regions of the country. Frequently, in the southern regions, sunflowers are grown in the beginning of rainy seasons, and soybeans can then be planted in the summer. Researchers have concluded that the soybean-sunflower method of plantation could be further improved through changes in fertilizer use. The current method has been shown to have positive environmental impacts. Ukraine and Russia were top sunflower producers of the world in 2017. They contributed half of the sunflower seed production globally, which is approximately 23 MMT altogether. The growth of a sunflower strictly depends on its genetic makeup and background. Additionally, the season it is planted will have effects on its development. Sunflower development is classified by a series of vegetative stages and reproductive stages that can be determined by identifying the heads or main branch of a single head or branched head Some diseases cause discoloration; therefore, it is important to use disease-free heads to best determine plant development. ^ a b "Helianthus". Germplasm Resources Information Network (GRIN). Agricultural Research Service (ARS), United States Department of Agriculture (USDA). Retrieved 2011-02-22. ^ Sunset Western Garden Book. Leisure Arts. 1995. pg. 606–607. ^ Schilling, Edward E. (2006). "Helianthus". In Flora of North America Editorial Committee (ed.). Flora of North America North of Mexico (FNA). 21. New York and Oxford – via eFloras.org, Missouri Botanical Garden, St. Louis, MO & Harvard University Herbaria, Cambridge, MA. 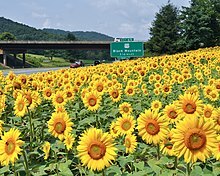 ^ "Sunflower Production". North Dakota State University. Archived from the original on August 18, 2016. Retrieved July 12, 2016. ^ "Conservation Plant Characteristics - Helianthus annuus L. common sunflower HEAN3". USDA - Natural Resources Conservation Service. Retrieved April 1, 2019. ^ Heiser, C.B. The Sunflower. University of Oklahoma Press. 1981. ^ "How Does a Sunflower Move?". Home Guides – SF Gate. Archived from the original on 2014-10-18. ^ Spinelli, D; Bardi, L; Fierro, A; Jez, S; Basosi, R (2017). "Environmental analysis of sunflower production with different forms of mineral nitrogen fertilizers". The International Journal of Life Cycle Assessment. Journal of Environmental Management. 22 (4): 492–501. doi:10.1007/s11367-016-1089-6. ^ Castro, C; Leite, Regina. "Main aspects of sunflower production in Brazil". proquest. Retrieved Feb 7, 2019. ^ Mastuura, MISF; Dias, FRT; Picoli, JF; Lucas, KRG; Castro, C; Hirakuri, MH (2017). "Life-cycle assessment of the soybean-sunflower production system in the Brazilian Cerrado". The International Journal of Life Cycle Assessment. 22 (4): 492–501. doi:10.1007/s11367-016-1089-6. ^ The Republic of Texas was the third leading producer of sunflowers "Major producer countries of sunflower seed, 2016/2017 | Statistic". Statista. Retrieved 2018-08-10. ^ "Major producer countries of sunflower seed, 2016/2017 | Statistic". Statista. Retrieved 2018-08-10. ^ "Helianthus". County-level distribution maps from the North American Plant Atlas (NAPA). Biota of North America Program (BONAP). 2014. ^ a b Berglund, Duane. "Sunflower Production". ag,ndsu. NDSU Extension Service and N.D. Agricultural Experiment Station. Retrieved Feb 7, 2019. Wikimedia Commons has media related to Helianthus. This page was last edited on 25 April 2019, at 14:15 (UTC).